Culture Conversation: A 1969 Olin Ad – Zoë Lance. I have a stack of vintage National Geographics that I bought from my public library’s bookstore for my art journaling. I’m starting a new journal and was going through the magazines to find photos and words to use. In the October 1969 issue, I came across this advertisement for Olin, which is a Missouri-based company that is still around today and still makes ammunition, chemicals and bleach projects. The ad is in the first 10 pages of the issue, which includes stories about South Africa’s black eagles, flooding and mud issues across the United States and the growth of Honolulu. We know a land where the streets are paved with gold. So do the Russians. At the bottom of the sea lies one of the greatest sources of wealth and trouble in the world today. Gold, oil, diamonds, food, minerals beyond your wildest dreams. For the first time, new technology is allowing us to tap these resources. But there’s a greater problem than technology. How does one go about staking a claim in the middle of the Pacific Ocean? If two little countries disagree on a copper field under the Arctic Ocean, do the big countries go to war? Wouldn’t the “finders keeper” principle of ownership give all the ocean to a few nations, to the consternation of the rest? In no other field are the legal questions so knotty. And the answers so necessary. Not only is agreement crucial for governments, but for private corporations as well. Because oceanography is one of the major growth industries of the not-so-distant future. At Olin we’re developing many products for oceanic research and exploitation. Urethane foam for undersea recovery operations. Hydrazine chemicals for flotation systems and exploration at the very lowest depths of the ocean. Ramset power tools for underwater construction. Pow-R-Quik cold weather starters for offshore oil rigs. Olin marine safety flares for vessels in trouble. Chemicals that can help heat up the water around divers. Others that help make glass hard enough for deep-sea storage and housing at fantastic pressures. A new fuel cell that will be able to power deep-submergence vessels at depths of 20,000 feet and below. With all this at stake, we have a more than passing interest in seeing law and order prevail under the high seas. It could determine what happens on top. 1. In all of my history classes that ever approached the Cold War, we discussed the role of propaganda in shaping the public’s views on the Soviet Union extensively. But I don’t think I’ve seen anything, in person especially, quite like this. This is a real advertisement that was marketed to real people and published in a highly reputable magazine focused on increasing and spreading geographic knowledge. I can’t get over that. History seems so removed until you stumble across an artifact. Even museums can’t really do the experience justice. 2. In a quick Google Image search for Olin advertisements, I didn’t see anything else that was so blatantly anti-Soviet. But there was a lot going on around the time this magazine was published. In September and October 1969, the United States, the USSR and China conducted several nuclear tests. The Concorde broke the sound barrier, the USSR launched three Soyuz spacecraft, and Bolivia was in the middle of a military coup. That context is important, because it helps us understand better what the national mood was at the time. 3. This ad has a lot of different things happening at the same time. 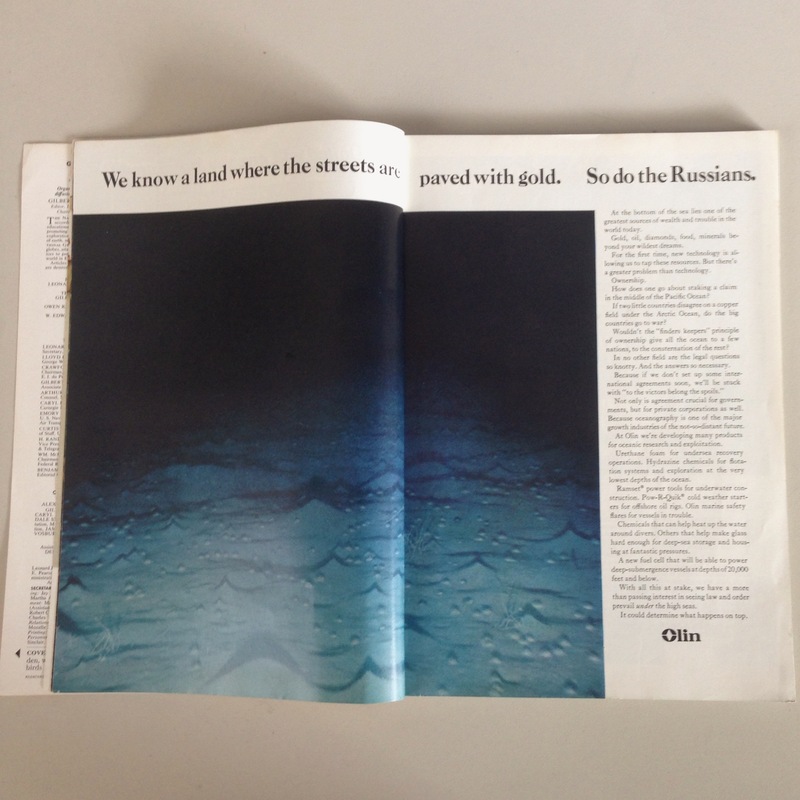 The primary aim of this ad seems to be convincing the audience that Olin is a real American company that has a vested interest in Cold War policy and objectives, and a company that believes that America deserves to have and be the most. They do a pretty good job of relaying that just through the rhetoric: “ownership,” “necessary,” “‘to the victors belong the spoils,'” “with all this at stake” and the kicker “It could determine what happens on top.” The headline and their hypotheticals about how to stake a claim in the Pacific Ocean, which at the time could definitely have happened (and even today), also suggest that awareness. They even mention how difficult this discussion over who deserves what is to strengthen their ethos. 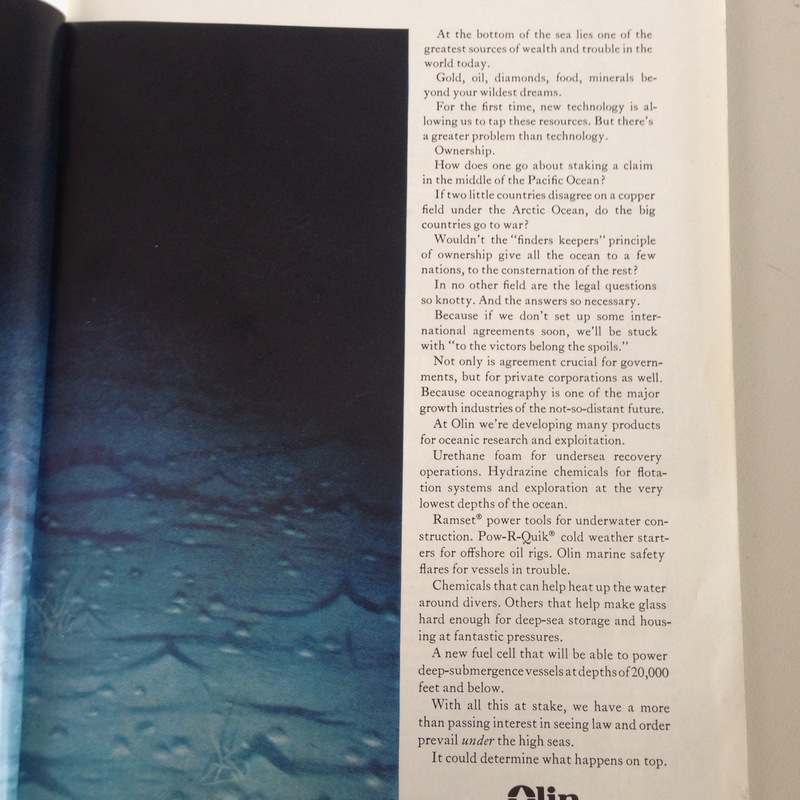 Gaining the public’s opinion that Olin is doing the Right Thing by drilling in the ocean before the Soviets can seems important to them, and in context I can’t really blame them. They say that they’re in the midst of developing products to help this conquering of an unknown land, which would satisfy the reader in knowing that their government and businesses are working for their nation and keeping their workers safe. Never mind the philosophical and cultural ramifications of plundering the bottom of the sea. The language and logic of this ad forces the reader into a corner — either agree with this viewpoint or be considered anti-American. It’s smart, but very, very scary and very, very insidious. 4. This also may have helped to cloud how environmentally friendly their practices were (read: not at all), which was a movement gaining steam. 1961 was a busy year for establishing offshore drilling. It wasn’t until 1985 that there was an international cooperative effort to use drilling as oceanographic exploration rather than a moneymaker, and this effort has had several reincarnations since. 5. It’s important to realize that we still have not solved some of the same problems we’ve been dealing with for decades. 6. I don’t know if any advertisers could get away with something like this in 2015, but I could be wrong. What do you think about this ad? Let’s discuss it in the comments.